The SQL Server Reporting Services Report Manager is functional, but it's not very customizable. The ASPX pages just reference compiled assemblies, so the only real way to modify them is via CSS. What makes that more difficult is that the SSRS HTML is poorly constructed so that the tags you'd most want to customize don't have Id's or Classes assigned. For instance, the most obvious customization anyone would want to make is to add a corporate logo, and there's no hook for that at all. The folder image is a simple <img> tag, nestled between two other spacer <img> tags, packed inside an unidentified <td>, and all those elements are written out in code1. The problem there is that there's no way, even with some descendant selector trickery, to target that folder image. IE7's support is kind of quirky - it sees HTML comments as page elements, for instance. That means it's difficult to write cross browser combinator based CSS rules. Targeting deeply nested elements with combinators is pretty difficult. Combinator based rules are inherently unstable, since any changes to the page's structure (including HTML comments, as mentioned above) can really mess up your page. Structure changes can cause your rule to be ignored or - much worse - point it at another page element. Those images do serve some use - they change depending on the current function you're performing in the site. Who needs an Upper Title, anyway? I went for the next best target - the rather useless "upper title" - since it's a div which actually has a class (div.msrs-uppertitle)assigned. First, let's look at the style changes, then we'll talk about the different ways to add them. We set a background image by URL. That will keep the reports up to date with our company logo as it may change in the future. Make sure to pick an image that's an appropriate size for that space. We set the background to no-repeat so it just displays once rather than tiling. That's handy even if the logo image has a border, since we don't have to be so precise on your height and width settings. We set a height and width which are large enough to display the logo. These should be just larger than your image size; you can just see via trial and error what looks best. This is one of those times where on the fly CSS editing tools like the IE DevToolbar or the Firefox Web Developer extension come in really handy. Now we need to get rid of the site title. I didn't want to mess with trying to blank it out in the SSRS Site Settings since it might be useful elsewhere, or someone might fill it in without knowing that it would conflict with the logo. The easiest solution is to use the Phark Image Replacement technique and hide the text by setting the indent to -5000px. Edit ReportingServices.css (in the C:\Program Files\Microsoft SQL Server\MSSQL.3\Reporting Services\ReportManager\Styles folder). Save the block of CSS (the bit that starts with ".msrs-uppertitle") to a file called customizations.css to the same folder as ReportingServices.css. You might want to add other customizations to it while you're at it, like this CSS fix for Firefox. Great, but the logo should link to the home page of our intranet! What!? Feature creep! Version 2! Changing style isn't a piece of cake, but at least there's a supported hook for it. You can't add a link via CSS, though. CSS2 allows for some limited content generation, but it doesn't support adding links; even if it did we'd be out of luck because IE7 doesn't support it. That addLoadEvent business is there because we can't modify the page until it has finished loading, but this script is included at the top of the page. A less sophisticated solution is to set a timeout to call SetLogoUrl, but addLoadEvent leverages the built in event model to call the function after the page has finished loading. IE uses attachEvent, while everyone else uses addEventListener, so we'll include some logic to make sure the right one gets called. Once we've got our DIV, we can just set the onclick behavior to navigate to the correct URL. We'll need to change the cursor to indicate that it's a link, too. But, can we change the navigation to use WPF/E with Ajax and pull in some Google Analytics? 2 Reporting Service installs into different directories depending on the order you install SQL Server services. A default installation will put Reporting Services in \Program Files\Microsoft SQL Server\MSSQL.3\Reporting Services, but that MSSQL.3 folder may be different on your machine. It's one in the morning in ireland and i have spent hours figuring out how to add a logo with a link to report manager, i really was pulling my hair out, that is until i came across your article, it was a godsend, thanks a million for script. it works perfectly. Does anyone know if it is legally legit to use reflector to decompile the Report Manager DLLs, modify as needed, recompile and deploy? "You can customize Report Manager in very limited ways. You can modify the application title on the Site Settings page. If you are a Web developer, you can modify the style sheets that contain the style information used by Report Manager. Because Report Manager is not specifically designed to support customization, you must thoroughly test any modification that you make. If you find that Report Manager does not meet your needs, you can develop a custom report viewer or configure SharePoint Web parts to find and view reports in a SharePoint site." I've also read the law regarding decompilation, and I'm still not entirely clear. Very useful post - thanks alot! 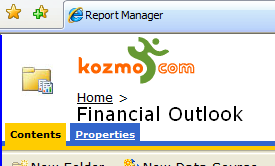 Can somebody tell me how do i customize my report names (ABC) to appear instead of the ugly Report Manager. No, i meant, just like using external application like c# we can title(IE)the report name from Report Manager to customized name (ABC). Is there a way to customize the title of IE just by SSRS. I am creating a aspx page. From that page i am going to call Report Manager.I want to show the customize report manager only launch from my application. is it possible? Please healp me. We decided it was easier in the long run to download and install Windows Sharepoint Servers 3.0 and install that on the report server, then switch reporting services into Sharepoint Intergrated mode. That gave us all the functionality of Reporting Services but also the fully customisable interface of Sharepoint. Works well for us! I note the comment about switching to Deep Integrated mode to use fully customisable interface of SharePoint. However has anyone successfully managed to pass parameters via query string into the Deep Integrated Report Viewer? It looks like to get parameter passing to work this way you still have to use the native report viewer, which is not exactly the sharepoint look and feel! I may be missing something though, does anyone out there have the missing piece of this jigsaw available yet? great article! !It's help me so much.. I tried this, but unless I replace 48folderopen.jpg with my logo, it doesn't work. note how they create article headlines to get viewers interested. excited about everything've got to say. Just my opinion, it could make your website a little livelier. I read this article completely about the resemblance of most up-to-date and earlier technologies, it's awesome article. enough to drop a comment :) I do have a few questions for you if you don't mind. Could it be just me or do a few of these responses look as if they are coming from brain dead folks? :-P And, if you are posting on additional online sites, I'd like to keep up with everything new you have to post. Ringlets differ in length of life and place of growth. Longest-living hair on his fore-part - to 4 or even 10 years, but the hair high the armpits, eyebrows and eyelashes - on the contrary 3-4 months. Japanese old lady Hiroko Yamaske took 18 years to reach its band length of 2.6 m common extension of trifle per date - involving 0.35-0.4 mm, and at end of day they bourgeon below par, and preferably in the evening. On the chairlady, beard and underarm trifle grows more actively than in the get of the body. O y眉zden giysi buldu臒umuzda 莽ok mutlu olduk. Minerals include calcium, chloride, copper, iodine magnesium, phosphorus, potassium, zinc, sodium and selenium.. The Royals then joined the Queen and 700 members of the livery companies, the original trade associations, at a grand lunch in Westminster Hall. Reservations would be recommended for most restaurants on the weekends. In addition, Timberland High Top Boots may also consider the future development of children's clothing market.